Classic French cuisine is served in a casual setting at this neighborhood bistro in Cooper-Young. 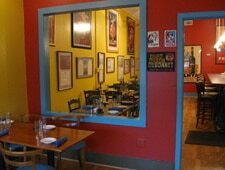 : Diners who want to enjoy traditional French fare minus the stuffy, upscale atmosphere flock to this casual bistro. Chef de cuisine Keith Riley attracts a crowd of regulars and die-hard fans with his classic crêpes, Niçoise salad, mussels with white wine sauce, and ham- and provolone-stuffed chicken breast, as well as strip steaks with pommes frites. Desserts, such as vanilla crème brûlée and bourbon bread pudding, are predictable but satisfying. The wine list is small but offers plenty of drinkable choices by the glass or bottle. Sunday brunch features eggs Benedict and croque monsieur, as well as burgers and pasta.